Contrary to blanket medical advice, shooing Fido out of the bedroom may not help people with long-term pain get a better night's sleep, said researcher Cary Brown of the Faculty of Rehabilitation Medicine. "Typically, people who have pain also have a lot of sleep problems, so usually if they ask their health-care provider about a pet, they're told to get the pet out of the bedroom. But that standard advice can actually be damaging." A small study published earlier this year of people who suffered long-term chronic pain revealed that hitting the hay with their pooches was "overwhelmingly positive" for them, Brown said. "They liked the physical contact with their dogs—cuddling before bed, and how it distracted them from feeling anxious about being alone at night. They felt more relaxed and safer so they weren't anxious as they were trying to sleep." The resulting sense of well-being helps settle the mind for a good night's rest, she added. "A sense of relaxation and caring are emotions that release positive hormones in our bodies that will help us sleep better." Having their pets bunking with them also helped ward off feelings of loneliness that often go hand-in-hand with a chronic health issue, Brown added. "There's a lot of losses in social circles associated with long-term pain, so a pet takes on a very significant role." In Canada in 2014, 32 per cent of households had one or more dogs and 37 per cent had cats, and about half of pet guardians share their bed or bedrooms with their four-legged pals. "When you ask people to remove an animal they are in the habit of co-sleeping with, it could have consequences the health-care provider hasn't considered," Brown said. "For some people with chronic pain, their relationship with their pet could be the only one they have and the comfort that dog or cat produces would be lost. It's equivalent to kicking their partner out of bed." The study also showed that dogs provide their human companions with a regular bedtime routine and daytime activity. "Those are two key things for sleep—you get up at the same time every day and you are active. 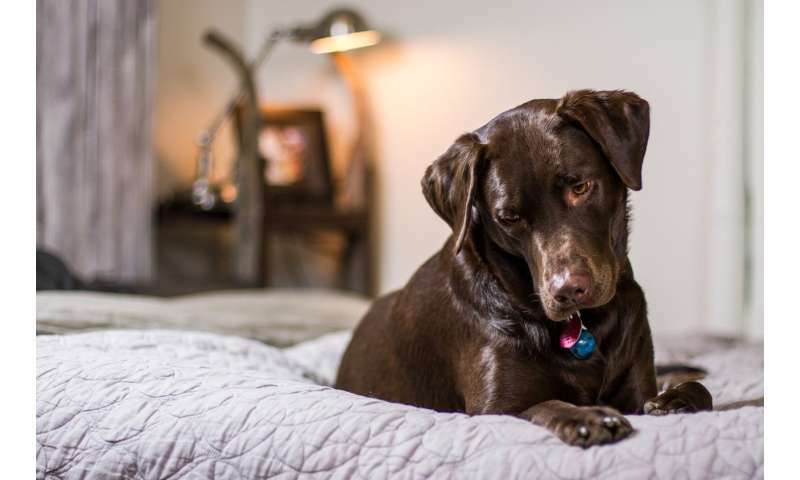 If you take the pet out of the equation, you lose that," said Brown, who added the recommendation to banish pets from the bedroom as part of good sleep hygiene isn't necessarily evidence-based and needs more research. "The belief is based on a certain theory of thought about associating certain practices with the bedroom, but they aren't updated or tested," she explained. "The study challenges this traditional advice and shows that we need to pursue this further." Medical professionals and their patients need to have deeper conversations about pets and bedtime, she said. "We shouldn't jump to simplistic thinking, that getting rid of the pet will make everything fine. We need to think more carefully about helping the patient weigh the pros and cons and make that decision for themselves, instead of being told. They shouldn't be made to feel guilty about prioritizing a pet relationship over the professional advice they've been given."